← Where have I been lately? So be sure to take full advantage of the abundance of fresh zucchini! This is also a wonderful way to get your kids in the kitchen. They will have a blast making their own “pasta”. My kids always seem more excited about eating a meal that they helped prepare. First you need to wash your zucchini. Trim the top and bottom off. Then with a vegetable peeler, make long ribbons. I go from the outside in, trying to get a little bit of green in each peel. You will be left with a little bit of the center, I like to chop that up and saute for a little pre-dinner snack for the kids. Or even better, throw it into whatever dish you have cooking. Don’t waste any bit of the zucchini. Heat a large saucepan, add about 2 tablespoons olive oil. Stir in garlic and red pepper flakes. 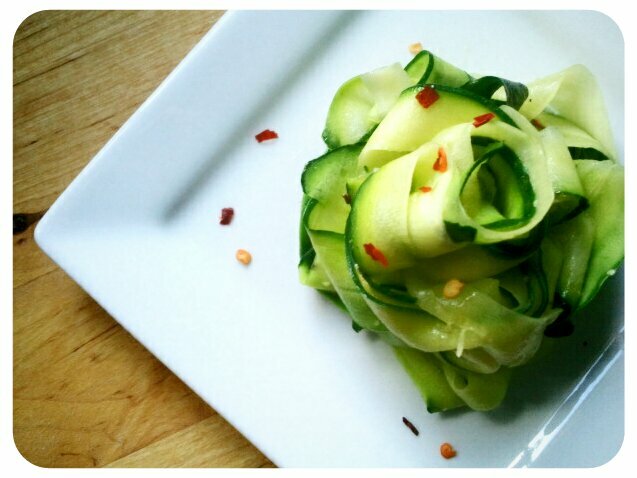 Once fragrant, add in your zucchini ribbons. Saute until slightly tender about 3-5 minutes. I like to keep mine, shall we say “al dente”? Basically, you don’t want a big bowl of mush. Love that! Works well with home made pesto too! Glad to see you are feeling up to posting recipes again!